The Business Writer's Handbook - ubiq bookshop: the best place to buy books! 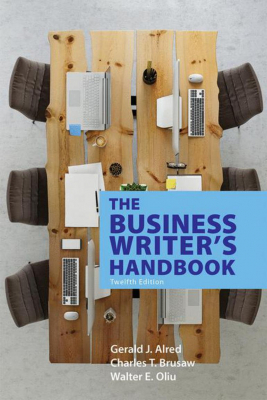 From abstracts to online professional profiles, from blogs and forums to the e-mail and formal reports, The Business Writer's Handbook uses smart, accessible language to spotlight and clarify business writing today. Hundreds of topic entries, 90+ sample documents, at-a-glance checklists, and clear, explicit models, communicate the real-world practices of successful business writers. Developed by a legendary author team with decades of combined academic and professional experience, the books intuitive, alphabetical organization makes it easy to navigate its extensive coverage of grammar, usage, and style. Plus, updated, in-depth treatment of pressing issues like the job search, audience awareness, source documentation, and social media use on the job resonate both in class and at the office.